Thinking of taking your family on a vacation? You should look into taking your family to the island of Jamaica! Many all-inclusive family resorts feature entertainment and activities for those of all ages These resorts often include clubs for children, as well activities that are directed toward ages ranging from toddlers to teens. Resorts Negril Jamaica othen offer children's programs. Many others feature game complexs and on-site water parks. Snorkeling trips to coral reefs, as well as scuba diving for children ages 12 and above are also commonly offered. Nannies, babysitting and other day-care facilities are available for those time when the adults need to get away. It is not uncommon for some resorts to allow children to stay with out cost, while others offer discounted rates for kids. Large rooms designed for families are offered that can accomodate 2 adults and 3 children. Now tht we've got the kids covered, how about the entertainment for the adults! Many family resort hotels offer adult-only dining, as well as adult-only swimming. If you ask a vacationer anywhere in the world where they would like to go on vacation, they'll tell you somewhere sunny and warm with blue water and soft sand. Negril Jamaica has all of these and more! Negril Jamaica is known worldwide as a tropical paradise. Witrh it's seven miles of white sand beaches, palm trees and warm waters, Negril is certainly one of the most beatuiful places in all of Jamaica. Negril is also host to some of the most beautiful sunsets you'll ever see. Negril is located on the western-most tip of the island, where you'll see a stunning display of color and light every evening. Negril also offers a wide variety of activities for the family, from shopping to watersports, to dining, dancing and nightclubs. Negril has many other options beside all-inclusive resorts. 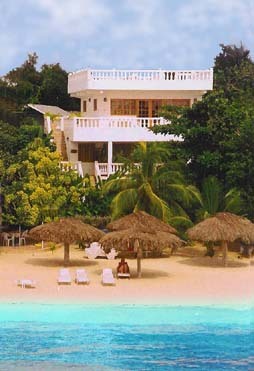 there are many villas, bed and breakfasts and hotels along Negril Beach. 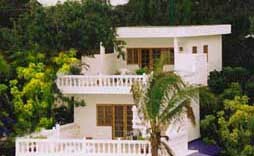 Staying in a Beach Villa offers vistors a taste of true Jamaican lifestyle. Right at the water's edge, the villas offer great access to clubs, shopping and dining right on the beach! If you choose to stay in a Negril Villa, you'll have the option of adjoining rooms for the adults and the kids, so you'll have your privacy while the kids will always be nearby. Even if you havn't got any children to entertain, Jamaica has even more for the adults! Jamaica is known worldwide as one of the most popular wedding and honeymoon spots in the Caribbean. The Beach House Villas and Hotel on Negril Beach offers wonderful and affordable wedding and honeymoon packages for couples on any budget. If you come to Jamaica and do not stay in Negril, be sure to time time to visit Negril Beach while you are on the island. It's incredible beauty and myriad of activities will be sure to create memories that will last a lifetime. Once you've been to Negril, you can be sure that you'll want to return again and again.